For the past 25 years, I’ve had the privilege of sharing my life with many Kuvasz. I work with other breeders, and together we participate in as many educational seminars with the farming community as possible (including Canada’s Outdoor Farm Show in Woodstock, Ontario every year in September. I truly believe that Livestock Guardian Dogs is a viable way to co-exist with the coyotes and other predators, and keep your livestock safe. 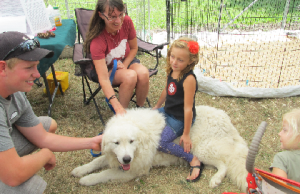 This is the 8th year in a row that the Kuvasz Club of Canada has had a booth at Canada’s Outdoor Farm Show, and every year is always a success. It is tiring, but we walk away exhilarated and happy that we have reached out to thousands of people to educate them about this magnificent breed, and we are always proud of our dogs. I’m very passionate about Livestock Guardian Dogs, and would love to show you what they are capable of. 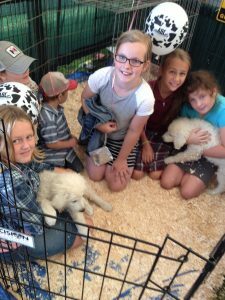 Whether you farm sheep, goats, chickens, alpacas, or want a loving and loyal pet for your kids or grandchildren, I invite you to come to Huron Kennels or to visit Canada’s Outdoor Farm Show and find me at the Kuvasz Club of Canada booth.